Thanks to our volunteers. What Kids Say. I've had a growing number of donors ask me for all sorts of documentation showing changes in habits, test scores and other indicators that will show them why they should continue to invest in Cabrini Connections. I don't have those types of reports, or the manpower to create them. I do have videos of kids saying "thank you" to their mentors. See this site if the CC page does not open properly. Here's another video showing impact of volunteers in the Citizen Schools program. I hope you'll view these. If you feel it is important for this to continue, send your donations to Cabrini Connections, Tutor/Mentor Connection, 800 W. Huron, Chicago, Il 60642 (or use this Pay Pal form). 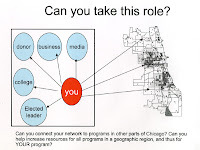 If you don't want to support Cabrini Connections, you can search the Chicago Program Links and other volunteer search databases and find similar organizations who are also connecting kids and volunteers and send donations to them. Good tutor/mentor programs depend on the donations of time and talent from volunteers, but it takes money to pay the rent, insurance and staff costs that support volunteer involvement. Please help us with your own donations. New Chicago Schools CEO. Here's Some Homework. Mayor Richyard Daley has appointed Ron Huberman, age 37, to replace Arne Duncan as CEO of Chicago Public Schools, saying, the system needs a good manager, and "I have the utmost faith in him (Huberman)." However, Marilyn Stewart, Chicago Teachers Union President,says "a good manager can't manage anything if he doesn't understand what he is managing." I remember a scene in a WW2 war movie where Robert Mitchem said "He does not need to know how to fly as long as he can point to where we want to go." This map shows all of the poorly performing schools in Chicago which is where you need to be mobilizing more resources, not just dollars, to help kids in Chicago get through school and into jobs and careers. Thus, I am assigning some homework for Mr. Huberman. These are a few articles and books that you should read so you're better prepared to take on this leadership role. For instance, you might read Charles Payne's new book, titled So Much Reform, So Little Change: The Persistence of Failure in Urban Schools. You also might visit this web site focused on the High School Drop-Out Crisis and read some of the articles. You definitely should visit the web site of the UCLA Center for Mental Health in Schools and read articles about social and emotional learning. These are just three out of more than 140 web sites I point to in the T/MC Research Links with information you need to digest and understand in order to be a more effective leader. You can find a few more in the discussion forum section titled "Understanding the Issues." As you absorb this information, you'll see that you face challenges that GOD herself, or even Barack Obama, cannot solve without a whole lot of help from many people working toward the same goals, for a long time. Thus, I encourage you to try to unite the education and business community behind a common vision of helping any child entering Chicago schools in fall 2008 being anchored in a job and starting a career by age 25. This graphic illustrates the role of parents, teachers, mentors and tutors, who PUSH kids to make good decisions and build the habits needed to achieve this goal. It also illustrates the role that our business and university communities need to take in PULLING kids through school and into adult careers and responsibilities. It also illustrates that the day has three time frames and they all need to be filled with good learning opportunities and extra adults who can mentor kids to make good decisions and provide social and emotional support. Don't try to manage programs in all three time frames. You have enough to do to make good schools. Use your leadership and vision to mobilize the business and faith community and the private sector to build a network of strong support programs that reach kids during the non-school hours. Get others to share ownership and responsibility with you. I encourage you to use this Tutor/Mentor Connection Strategy Map as your own. Just change the blue box at the top to read Chicago Public Schools, or Ron's Vision, and see if it doesn't do a good job of outlining a vision and strategy that might unite many people in Chicago toward a goal we might all share. As long as I'm able to find volunteers and donors to support Cabrini Connections and the Tutor/Mentor Connection, I'll do what I can to help you learn what you need to know, and help you mobilize all of the people and resources you'll need to succeed in this job. I've written many articles over the past few years intended to draw attention to volunteer-based tutoring mentoring as a form of service learning that engages adults beyond poverty as change agents in the lives of kids living in poverty. 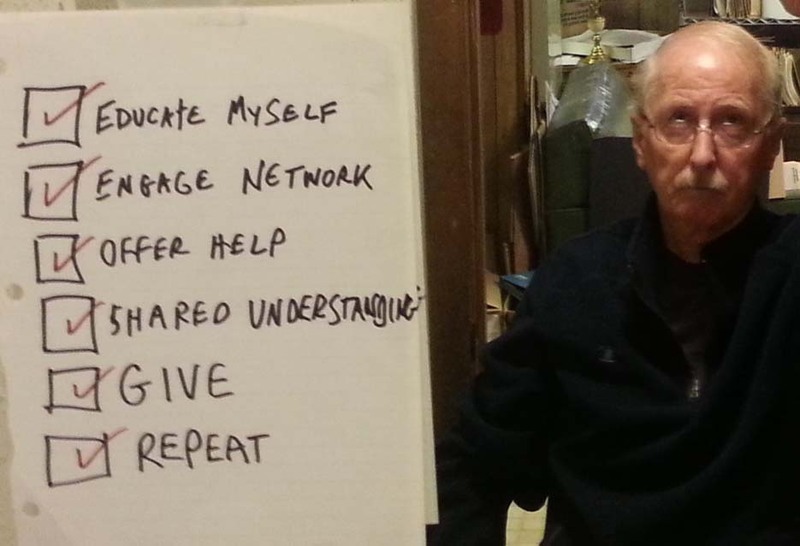 In these articles I point to information created by the Tutor/Mentor Connection and others that people can use to build their own understanding and commitment, then focus actions on specific locations in Chicago or other cities. I've more than 14,000 people in my Filemaker Pro database and am probably connected to many more via the way I network and the way people find the T/MC and article I write when they do Google searches. However, I've never had a good way to illustrate who I was connecting with, and how I was focusing their attention. Until now. This graphic is a photo from image created in Facebook. 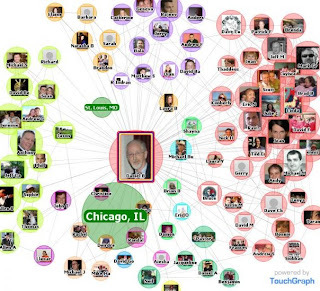 It shows how I'm connected to different groups of people from Chicago and from around the world, and pulling them to the information we share on the Internet. Our goal is to teach leaders and volunteers at Cabrini Connections and other tutor/mentor programs to constantly tell their story to people in their networks, in ways that increase the number of people who shop a map to choose what neighborhoods of the city, and what programs in each neighborhood, they want to support as volunteers, or donors, or business, college or education partners. Through the Tutor/Mentor Connection we're trying to coach individual programs to use these tools, to help them build their own programs, and to help build support for all programs in the city. Read the article written by T/MC Coordinator Nicole White, that she wrote about meeting with Chicago HOPES, and helping them create their own blog strategy. Read this article written by Chris Warren, our Public Interest Program Fellow from Northwestern about how he is reaching out to health care organizations. I encourage you to book mark these blogs and follow the work they are doing to help tutor/mentor programs grow. Then visit my Facebook page and view the network photos, to see how we describe our network and how it grows. It is the third day of the Obama Presidency. 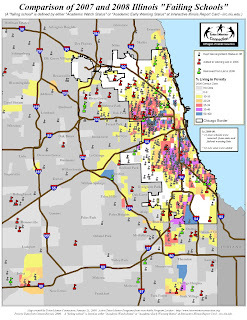 To support his commitment to education and social justice, we've posted a new map and article on the Mapping For Justice blog, which shows the change from 2007 to 2008 of Chicago area schools on the under-performing list. As readers and leaders look at this map, I encourage you to download and listen to the presentation from the December 2008 School Policy Forum hosted by Catalyst. Be sure to view the power point from the December session. Note, the first part of this shows a student leadership program at Orr High School. Starting on page 16 you can find the presentation by Dr. Michael Woolley, showing the importance of extra adults in the lives of inner-city kids. President Obama and Secretary Duncan, please look at this map, and this presentation. Use your leadership to encourage private sector investment in the growth of volunteer-based tutor/mentor programs in the non-school hours and in neighborhoods around every poorly performing school in Chicago, New York, Detroit and every other urban area where high concentrations of poverty and high numbers of kids have a huge influence on poorly performing schools. Don't lock these programs into test scores and school curriculum. Give them the flexible funding to to connect kids with mentors, and keep them connected for multiple years. If you're a business leader, at a university, or lead a faith group, you can use these maps to build strategies of engagement in every neighborhood where you have a facility and where you do business. Don't wait for the President to show you where. These maps show where you are needed and you are needed TODAY. After the Excitement, Day one. Achieving the Obama vision. Yes. I was glued to the TV yesterday. I was inspired. I think I'm going to post that photo of the Washington Mall, showing almost 2 million people, and thousands of flags, on my wall. Like many of my fellow world citizens, I was really exicited and inspired by the events that took place yesterday. I loved the interviews with a couple of 10-year old boys who told of how they were inspired to be leaders because of the example of Barack Obama. I hope such inspiration has infected kids throughout America, including my own 11-year old son and 18-year old daughter, not just kids living in the high poverty neighborhoods of this country and this world. However, unlike millions of others, I've been working to mobilize volunteer time, talent and dollars to help inner city kids "be like Barack" for more than 35 years. Thus, my hope is that this new leadership, and new energy, brings reinforcements to our efforts and more strategic, and long-term, thinking to our leaders. Making a speach is only one step in mobilizing an army. Such speaches need to be given by many leaders in many places, for many years. However, mobilizing an army and pointing it in the right direction, or making sure it does the right work, at the right time, requires a lot more sophistication. I hope leaders in Washington, and in local state and city governments, as well as in business, colleges, healthcare and faith groups, are searching the internet for blueprints they might borrow so that as they mobilize, they can also point volunteers and flexible operating and innovation dollars to all of the places where help is needed. Even if we point troops to the right places, getting them on the beach in the face of a determined, entrenched enemy, will be a failure without proper training, proper weapons, and without the support of many different people and organizations. The VILLAGE needs to be mobilized and working together. The battle plan for solving poverty, should be a complex map, showing the infrastructure needed to keep troops in battle, in many places, for many, many years. Again, I hope that leaders are searching the internet for models they can use. If you're goal is to help inner city kids get an expanded network of adult support that helps kids come to school better prepared to learn, and supports them as they grow from first grade, to a job and career, then I encourage you to view this strategy map and some of the other strategy maps the Tutor/Mentor Connection has created. If you're looking for ideas of how to mobilize others, and for ways to use maps to make sure you're reaching youth in all poverty areas of Chicago, or other cities, visit the Tutor/Mentor Institute and browse the articles posted there. If think these ideas are useful, borrow them and apply them in your own service. As Obama and many other have said in the past 24 hours, "it will take the individual contributions and sacrifices of many of us". If you are part of one of the 1500 links on the T/MC web library, I hope you'll reach out to me so we can find ways to work together, if for no other reason than to help your ideas, and my ideas, get more readership. These ideas have little value if too few people view them or understand them and act upon them. Thus, I encorage you to use your blogs, advertising and personal networking to increase the number of people who use the information we provide ( meaning the T/MC and the other 1500 organizations we point to on our sites) to guide their actions so that we have a well-supported army of volunteers, leaders and business partners helping kids in every high poverty area of this country rise to be whatever their aspirations point them to. This is day one. When you get up on day two, look in the mirror and decide what you will do and where you will get the information that guides you. When you end the day, look in the mirror and report what you did. If enough people do this every day for the next 4 years, we'll all be able to look at a mountain of accomplishments, and maps showing where we have a foothold, or making some progress, in solving the complex social problems President Obama faces as he goes through Day One. This photo is from a 1999 Tutor/Mentor Leadership and Networking Conference where Barack Obama was a speaker. During this conference he helped pass out best practice awards and grants made by the Lawyers Lend A Hand Program at the Chicago Bar Association/Foundation. This graphic illustrates the role we hope President Obama will take in the coming weeks, months and years. If he encourages people he influences to take on leadership roles, and to provide personal sacrifices of time, talent and dollars, in high poverty neighborhoods of Chicago and other urban areas, his leadership can change the way non profits working with kids are supported, and can provide real pipelines to jobs and careers for kids who will be watching the inauguration from their first grade classrooms. Be the hope! Be the leader. Point people to maps and program locator search portals that enable people to understand where and why volunteer-based tutor/mentor programs are needed, and ways they can help keep such programs connected with kids and volunteers throughout the 4 to 8 years you will be in office. During the coming week every member of the Cabrini Connections, Tutor/Mentor Connection staff will be writing blog articles and spreading messages on Facebook, Linked In and Ning.com to tell the story of volunteer-based tutor/mentor programs and to encourage leadership involvement. I hope that others will do the same and that they will link stories as suggested in this blog exchange article. Visit the new Tutor/Mentor Institute section to find more ways to support a volunteer-based tutor/mentor program strategy. For the past 10 years we've been using the same web site to share ideas that originated with Cabrini Connections, Tutor/Mentor Connection. This site has finally been rebuilt, and launched today. Visit the new Tutor/Mentor Institute and use it often to help you build a volunteer-based tutor/mentor strategy for your own community. In less than two weeks the United States will have a new Commander in Chief. We face huge challenges locally, nationally and around the world. How can one man focus his attention on all of these places and problems at the same time, and consistently for the next four to eight years? I focus on how volunteer-based tutor/mentor programs can connect kids living in poverty neighborhoods and attending poorly-performing schools with a adults who don't live in poverty and who can model and open doors to a variety of career aspirations and learning opportunities. The Tutor/Mentor Connection (T/MC) creates maps that show where poverty and poorly performing schools are located, and where volunteer-based tutor/mentor programs are located. Then I create overlays showing assets, such as businesses, churches, colleges, etc. who could provide volunteers, technology, ideas, talent,etc. to help tutor/mentor programs grow in every part of the city where the business, college or hospital is located. 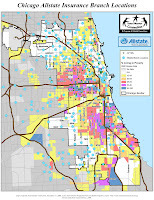 This example shows Allstate Insurance company offices in the Chicago region. 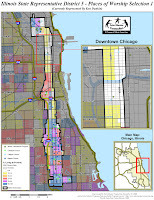 Using this map, company leaders could create communications strategies connecting offices in each section of the city with community-based organizations and schools in the same section. Or, leaders of non profits in each section could target company locations in their own part of the city with requests for help. Getting the attention of business leaders and drawing their consistent support for your non profit are challenges. With multiple non profits doing the same work, but in different places, they are all competing for the attention of the same donors. Some win. Most lose. This next map shows the 5th District of the Illinois State Legislature. The map below this shows insurance companies with offices in this district. You can see that this District is a narrow strip that stretches from the Near North Cabrini-Green area, South to past 63rd Street. 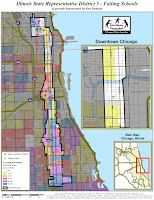 While the far North and most of the Southern part of the district have neighborhoods of high poverty and poorly performing schools, one part of the district cuts through the West Loop, with many businesses, including many insurance companies. What could the State Representative of this district be doing to connect these businesses with non profit tutor/mentor programs in the district? This last map shows Christian, Catholic and Baptist churches in this district. As faith leaders committed to social justice, what could they be doing to connect the rich people in this district with the poor people? 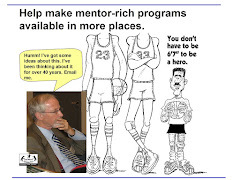 In the Tutor/Mentor Institute there are a variety of pdf essays on collaboration, leadership and ways individuals can use maps and their own personal and professional evangelism to draw attention to poverty, and draw resources to places in poor neighborhoods that are trying to help kids make decisions that will change how well they do in school, and how well they are prepared for jobs and careers. If President Obama, and Secretary of Education Arne Duncan, point to these maps on a regular basis, and encourage public and private partnerships in every state to create and use strategy maps like these, they can use the visibility of the Presidency, as well as leverage of public funds, to encourage private sector involvement in high poverty neighborhoods and tutor/mentor programs throughout the country. Each week the President does a radio address and a web cast on the internet. Why not highlight one of these maps each week, and provide links to maps for every city and every state, keeping attention focused on what needs to be happening in the neighborhoods to help create the CHANGE that this President has promised. 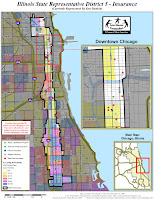 See more maps like these in the MappingforJustice blog, in the Tutor/Mentor Map Gallery, and in the Chicago Tutor/Mentor Program Locator. These maps are made possible by a generous donation made in 2007 by an anonymous donor. If you'd like to help us continue to provide these maps, please consider becoming a sponsor or supporting the Tutor/Mentor Connection with a donation. Send donations to Cabrini Connections, Tutor/Mentor Connection, 800 W. Huron, Chicago, Il. 60642. Call 312-492-9614 to inquire about sponsor and grant opportunities. There will be millions of people trying to get the attention of the new administration and many are paying thousands of dollars to attend one of the events in Washington on January 20, 2009. It's almost impossible to get attention in such a crowd. It's even more difficult to get your message across. Why not try a different strategy. If you write a blog article about how the Obama administration can help your organization help kids, and link it to others doing the same thing, you can contribute to a splash of public attention that draws people from the inauguration celebration and all of the policy forums to what you and others have to say about how public and private leaders can help you do your work. So, write an article anytime during the week of the inauguration and if you put a link in your article to this blog, you can add your link in a list I'm building on the T/MC web site. Or you can post your blog link (and article) on our Ning page . If we can build a blog action list in many place, linking them all together in web hubs, like the T/MC Links library we can make our own light shine brighter, and perhaps capture some of this attention for our own efforts. I can't be in DC and don't want to be one of a hundred, or a thousand faces in a crowd in Chicago. Yet I want people to hear my message, reflect on it, then act on it. You do too, don't you! So write a blog article that connects public policy, private sector involvement and the work you do to help kids in poverty have a ladder of support that makes it possible for more of them to be a leader in business, education and government in the future. Let's see what kind of noise we can make. Write your blogs. Share your links. 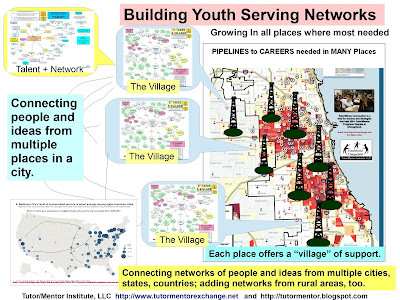 If you've visited this blog more than a few times, you've seen me use maps to illustrate where tutor/mentor programs are needed, and where volunteers, donors, leaders and business partners are needed to support long-term connections of programs and volunteers with youth. Here's an interesting article on information visualization that illustrates uses of maps and other visual tools to communicate ideas. If you work in this area and would like to add your talent to the mission of the Tutor/Mentor Connection please contact us. You do not need to be in Chicago to contribute your time and talent to this work. President-elect Obama innovated ways to use the Internet to get elected. Now let's help him use the same tools to mobilize citizen power to solve some of the problems facing America. I encourage you to visit this Obama Urban Policy site and cast your vote for ideas presented, or add your own suggestion. It only takes a few minutes but makes you an engine of change.